Presenting wine in good packaging is about more than just navigating the fact that bottles are virtually impossible to wrap: our hand-crafted, traditional wooden cases ensure that your gift will not only look remarkable, but also that it will be protected in transit and can be easily stored. Packaging will only be supplied as part of a wine or spirit order. 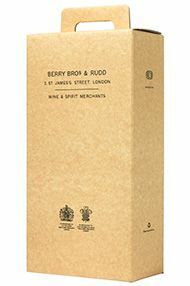 For orders of 12 bottles, wines are usually delivered in a high quality Berry Bros. & Rudd box, free of charge. If, however, you would like additional gift packaging, please select from the options below. Please note: Some non-standard champagne bottles will not fit into the wooden gift boxes. If unsure please contact our customer services team on 0800 280 2440 to discuss. This single bottle box is the ideal way to showcase a special bottle of wine, and ensure you give a gift that’s remembered. Our wooden boxes, crafted from pine grown in Gascogne forest, are made by a French firm called Adam, which has been producing traditional wine cases for the most prestigious Chateaux since 1880. 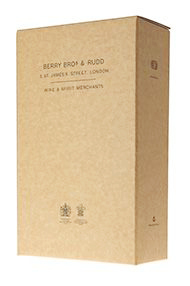 The classic, solid-wood boxes are fire-branded with the Berry Bros. & Rudd logo and closed with a smart metallic hinge to keep their contents secure. If you are planning to give a special brace of bottles that should be appreciated side by side – perhaps a good Claret and a white Burgundy, or a traditional-style and a modern-style Rioja – this is a smart – and lasting – way to present them. 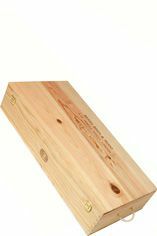 Our wooden gift boxes, crafted from pine grown in Gascogne forest, are made by a French firm called Adam, which has been producing traditional wine cases for the most prestigious Chateaux since 1880. 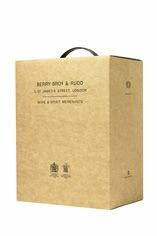 The classic, solid-wood boxes are fire-branded with the Berry Bros. & Rudd logo and closed with a smart metallic hinge to keep their contents secure. 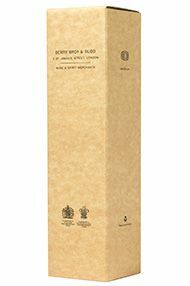 A magnum of wine is an impressive gift regardless of how it is packaged, but this carefully crafted wooden case will ensure it looks like an absolute showstopper. 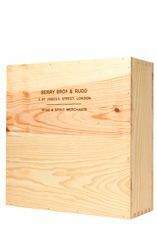 Berry Bros. & Rudd’s wooden gift boxes, crafted from pine grown in Gascogne forest, are made by a French firm called Adam, which has been producing traditional wine cases for the most prestigious Chateaux since 1880. The classic, solid-wood boxes are fire-branded with our logo and closed with a smart metallic hinge to keep their contents secure. Make a statement with a trio of wines by packing them together in this classic case. 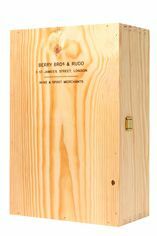 Our wooden gift boxes, crafted from pine grown in Gascogne forest, are made by a French firm called Adam, which has been producing traditional wine cases for the most prestigious Chateaux since 1880. 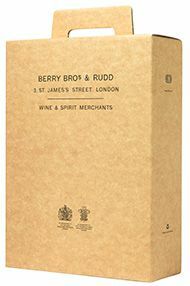 The classic, solid-wood boxes are fire-branded with the Berry Bros. & Rudd logo and closed with a smart metallic hinge to keep their contents secure. A carefully chosen selection of six bottles will look remarkable when laid side by side in a wooden case which is worthy of any Chateau. 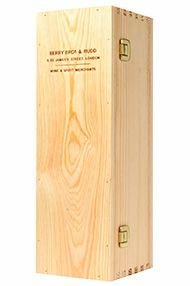 Our wooden gift boxes, crafted from pine grown in Gascogne forest, are made by a French firm called Adam, which has been producing traditional wine cases for the most prestigious wine houses since 1880. 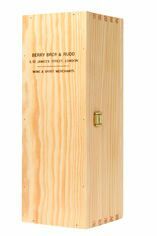 The classic, solid-wood boxes are fire-branded with the Berry Bros. & Rudd logo and barrel emblem, closed with a smart metallic hinge to keep their contents secure and also have a rope handle to assist with transportation.